A current trend that many homeowners are into is refinishing or painting their kitchen cabinets. Painting is an economical way of giving your kitchen a beautiful transformation without the added costs of installing brand new cabinets. Some are choosing lacquer to finish their cabinets and furniture, while others are using high-quality enamel paints. There are many options available if you want to renovate your kitchen, but since lacquer and paint are the two main options, here’s what you need to know about the differences between them. What Is a Lacquer Paint? A lacquer paint is clear coating that, when dried, produces a solid, durable finish. It is designed to be chip-resistant, waterproof, and breathable. Lacquers can be applied to a variety of surfaces such as wood and metal and they come in a range of colours, as well as clear finishes. Unlike paint, which is thicker and can absorb moisture in wood causing it to soften over time, lacquer is much more flexible and can adapt to the expanding and contracting of wood surfaces. Since lacquer is thinner than the other finishes, it is almost always applied using a sprayer instead of a roller or brush. Lacquer also comes in different levels of sheen, from matte to high gloss. Wear and tear can dull down the look of lacquer, which is why is can be polished to maintain its lustrous appearance. This type of lacquer is the most commonly used out of all types of lacquer. It is sensitive to heat and certain solvents, but still dries quickly. It is commonly used on musical instruments and wooden products and was once very popular to be used in automobiles. Unfortunately, this type of lacquer yellows as it ages, making it a troublesome choice for lightly coloured wood. As for safety, it is hazardous, flammable, and highly toxic, so it should only be used by professionals. Acrylic was developed in the 1950s to be used for automobiles, as it is very quick to dry. Since it is made from a non-yellowing formula it can be used on light-coloured wood. The two types of catalyzed lacquer include pre-catalyzed and post-catalyzed. The first option is premixed by the manufacturer or store when purchased, while the second type is a two-part system that the purchaser must mix. Once mixed, they have a short window of time when they must be used. The main reason why homeowners and professionals like this type of lacquer is that the chemical reaction that forms the finish makes it highly durable. Water-based lacquer is gradually becoming one of the most widespread types of lacquer used to refinish kitchen cabinets. It is a much more environmentally friendlier option than the above mentioned lacquers since it doesn’t contain the same toxic chemicals, yet it is still durable and scratch resistant. While each type of paint has its own benefits and drawbacks, one may be more suitable for the job you’re working on. Here are some of the main benefits to choosing lacquer over enamel paint when it comes to refinishing your kitchen or bathroom cabinets. As mentioned above, lacquer is very tough. It lasts longer than any of its competitors without chipping and flaking off. It remains clear for years and non-yellowing options are available to keep your furniture looking in tip-top shape for a very long time. Since it is thinner than most products of its kind, it penetrates deeper into the materials, providing a durable seal that protects the wood from the inside-out. It can dry to the touch within an hour and can be re-coated in a few hours. Both enamel paint and lacquers can achieve a glossy finish, but lacquer results in a thicker coat. Lacquer paint may need several coats to get the right finish, but once it is complete it looks smooth and seamless on furniture and cabinets in the kitchen. Unlike other paints, lacquer reactivates each coat underneath it to allow for a smooth, level finish, even if you apply multiple coats. Lacquer is slightly more expensive than paint, depending on the type you choose. And since lacquer should only be used in well-ventilated places, you should always hire a professional kitchen cabinet painter to get the job done using the right ventilation, protective material and equipment. This may result in a greater initial investment; however, many people trust lacquer to be the best finish for wood and there are many benefits to enjoy once it has dried and the job is complete. 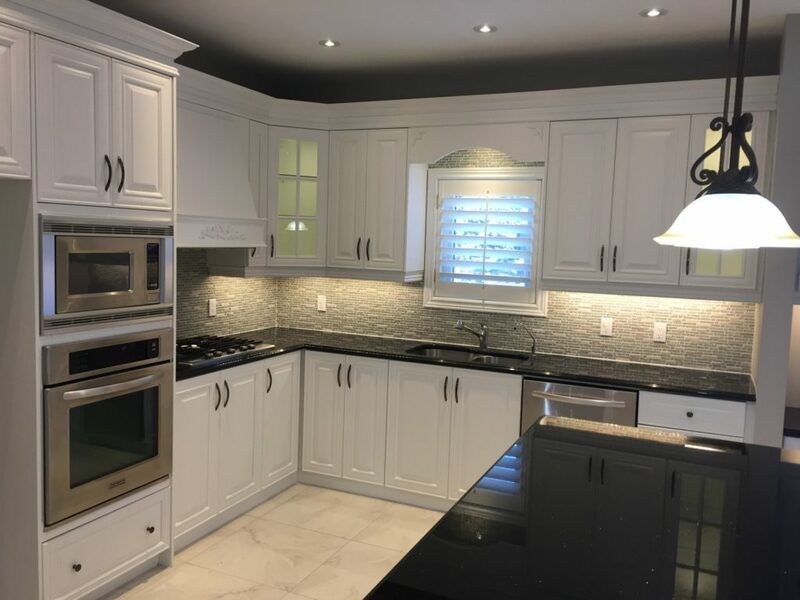 If you’re looking to give your kitchen a beautiful colour transformation without the hefty price tag, refinishing your cabinets is the best option! At Booth7, we are a one-stop, painting solutions shop. We can give your home a fresh look and new style and help you navigate the often-confusing world of renovating your kitchen. Our experienced team offers high-quality, professional kitchen cabinet painting and refinishing services and excellent customer service. We use only water-based, low VOC lacquer and solvents that are very consumer and household-friendly. Worried about lingering paint smell and breathing in hazardous paint fumes? Don’t be…with Booth7, you won’t have that problem. In fact, we’ve never had a single complaint about lingering paint smells during or after a refinishing project. We handle all the details of your project from start to finish, so you can trust you are in good hands!